Have you noticed the new no food waste trend? It is now en vogue to eat every single part of a food, including the stems, the roots, the flowers, the bark, the seeds, right down to the ears and tail of an animal. I do my best to lead a no waste life. “Never use anything once,” is one of my mottos. When I roast a chicken I save the carcass for broth, when I steam kale, I reserve the stems for sautéing, and my egg shells are composted to create rich soil. So naturally I rejoice in the no food waste movement! No wasted food equals more food to eat. Recently, a pop-up in New York based an entire restaurant on this concept. WastED was created by Blue Hill and Stone Barns Farm, the forerunners in farm‑to‑table eating going back sixteen years ago. For three weeks, WastED served a menu comprised of food seconds and thirds, helping to relieve the food system of ignored and discarded foods, perfectly suited to satisfying taste palates. Diners noshed on pockmarked potatoes and parsnips, pasta trimmings and cured cuts of waste-fed pigs. When I cook, I look for meat cuts I’ve never tried before, which goes along with my other motto, “never cook anything twice.” Why make the same meal over and over when there are thousands and thousands of iterations? Variety is the spice of life! If you’re in a rut and need more recipes, go try everything in The Sparkle Kitchen Cookbook. 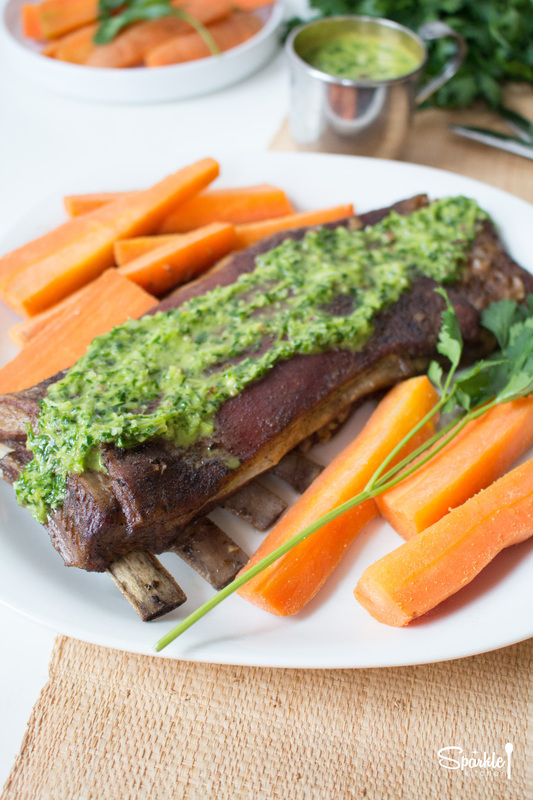 I use lamb riblets in this recipe, which are fattier than your traditional leg or rack. A thick layer of fat sits right on top of the meat. This is where you get all that rich, lamby flavor. 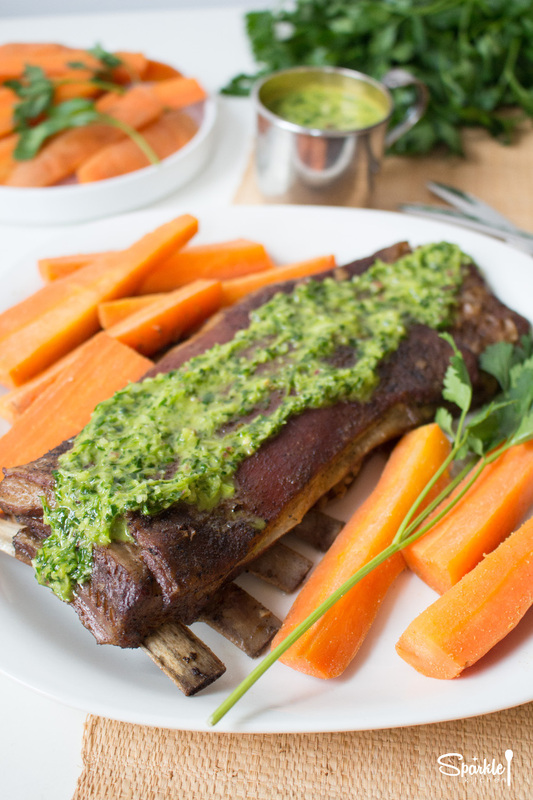 Lamb fat contains a certain fatty acid that provides a wild, gamey flavor. I like to keep all this goodness, but if you’re not a fan of the wild side, simply slice some of the fat away before cooking. 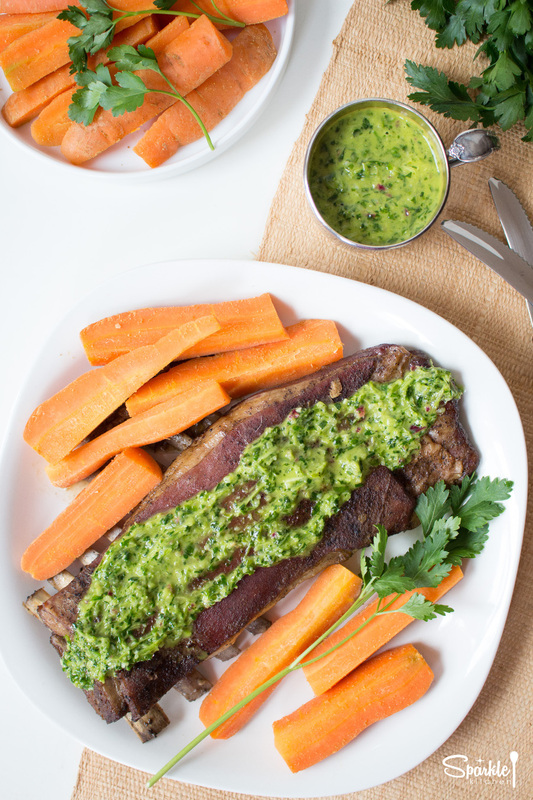 Chimichurri is a fresh, bright sauce that compliments the richness of the lamb. 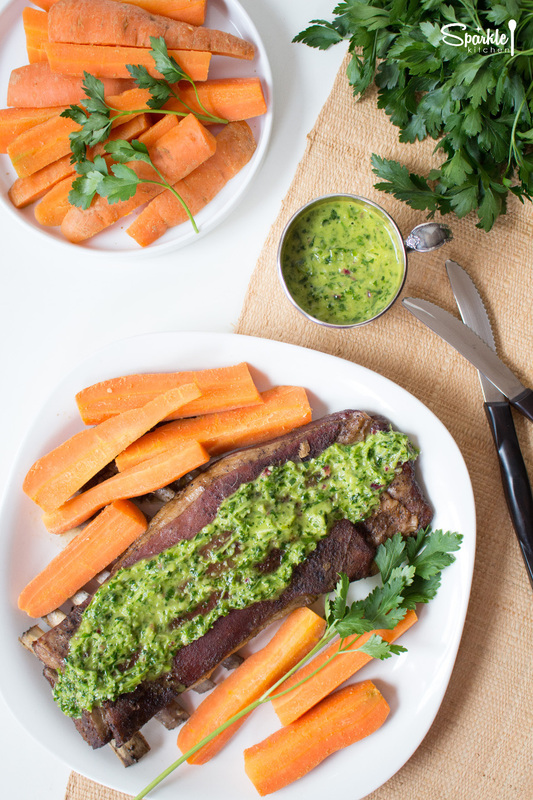 In keeping with the no food waste method, be sure to use the parsley, stem to leaf. The stems are tender and are even packed with more nutrients than the leaves. 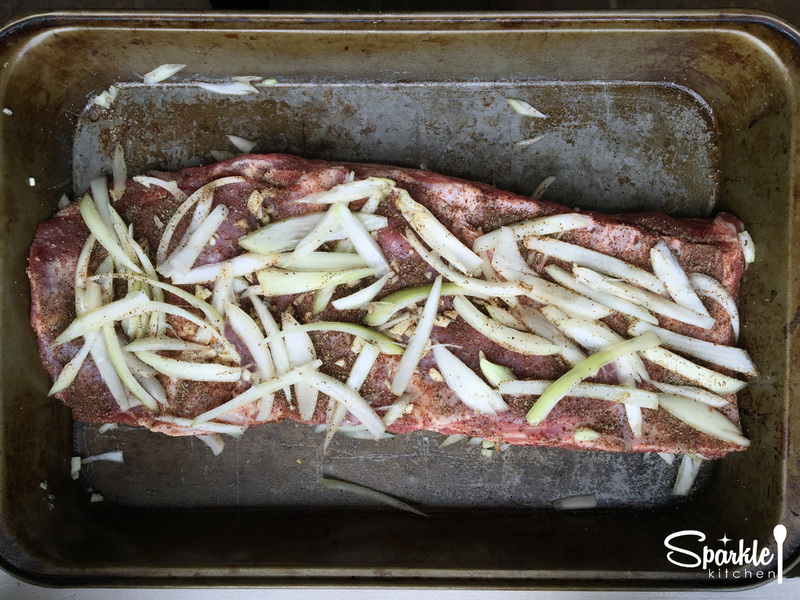 Slow roasted lamb in a simple marinade of onions, chili powder and garlic. First to season the meat. Mix together salt, pepper and chili powder. Rub into the lamb, evenly distributing. Then rub in the garlic. Spread onions into the bottom of a metal baking pan and place the lamb on top. Cover with aluminum foil and place in the fridge for at least two hours or overnight, flipping over periodically to ensure even seasoning. The longer it sits, the more flavorful the meat will be. Remove the lamb from the fridge. Pour two cups of water into the pan and recover with foil. Roast, covered for 1 ½ hours. Remove lamb from the oven and flip over. Cover again with foil and roast for another 30 minutes. The lamb will have now cooked for two hours. Test the doneness by pulling at the edge with a fork. If the meat loosens easily, it’s done. If not, cook an additional 30 minutes covered in the oven. Once done roasting, remove from the oven. Turn the oven to broil. Take off the aluminum foil and broil the lamb for three minutes. Just until the top is crispy. NOTE: The pan sauce includes all the fat drippings from the lamb and makes an excellent gravy. You can also reserve it in a glass jar and use for other cooking. 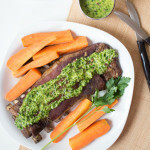 A garlicy, lemon parsley sauce. Place all ingredients in a food processor. Blend until fully incorporated, about 2 minutes.